Vertigo is the sensation where everything around you is seemingly spinning, and it feels like you’re on a roller coaster. You also feel unsteady or off-balance, although there is no movement at all. It is a symptom sometimes used to refer to a fear of heights; however, this is not a correct medical term. A fear of heights is called acrophobia. 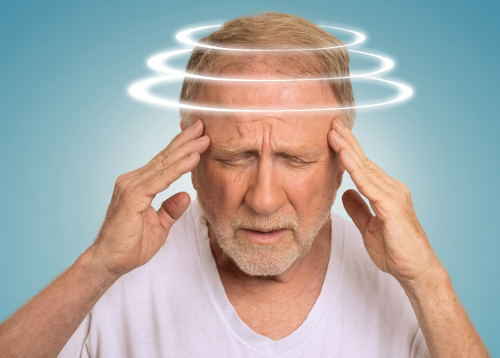 It is a sense of dizziness and a symptom of a wide range of balance conditions, including Meniere’s disease, labyrinthitis, and benign paroxysmal positional vertigo (BPPV). Research shows that approximately 40% of people over the age of 40 experience this condition at least once in life. Overall, vertigo and dizziness affect around five percent to 10% of the population. Vertigo develops when delicate parts of the ears fail to send information accurately to the brain about your position. This condition occurs for various reasons, including blows to the head, injuries, ear infections, and inflammation. With that said, there are various natural treatments for vertigo, including homeopathic remedies. Symptoms will come and go, and last anywhere from several minutes to many days. Some people experience worse symptoms than others, and it depends on things like fluid accumulation in the ear, as well as how much damage has affected the ear. Sometimes, vertigo will disappear on its own, because the senses and body can adapt to changes in the ear. At the same time, it may return without any warning and reappear from time to time. While vertigo is often brought on by changing the position of the head, there are also underlying causes that contribute to the problem. Labyrinthitis, also called vestibular neuritis, is caused by viruses or ear infections that attack the inner ear. Chronic ear infections lead to inflammation, and this damages the nerves necessary for balance and orientation. Meniere’s disease is a rare and severe inner-ear disorder triggered by fluid accumulation in the inner ear. As a result, it causes pressure levels to change in the ear. Tinnitus and hearing loss are common with Meniere’s disease. It affects just 0.2% of those aged 40 to 60 years old. BPPV is a peripheral vertigo linked to inner ear problems that lead to dizziness. The underlying cause of BPPV is calcium crystals, called otoconia, dislodging from an area within the ear known as the labyrinth. BPPV can stimulate nerve hairs in the ears, which sends false signals to the brain. It can be brought on by simple movements like exercising, looking up or down, rolling over onto one side while sleeping, or tilting the head to one side. Other possible causes of vertigo include high cholesterol, cold feet, ear pain, dehydration, double vision, diabetes, anemia, facial paralysis, a stroke or brain tumor, head or neck injury, migraines or severe headaches, ear damage from medications, and calcium deficiency. There are two common forms of vertigo—peripheral vertigo and central vertigo. Peripheral vertigo will result from a problem with the inner ear or vestibular nerve, which connects the inner ear and the brain. Central vertigo is often a problem in the brain that occurs specifically in the cerebellum—the part of the brain that controls balance and movement. Here is a detailed look at peripheral vertigo and central vertigo. Approximately 93% of vertigo cases are considered peripheral vertigo, and are caused by Meniere’s disease, BPPV, or acute peripheral vestibulopathy (APV)—inflammation of the inner ear with a sudden onset of vertigo. Another cause could be a perilymphatic fistula, which is an abnormal connection between the inner ear and middle ear. Other potential rare causes of peripheral vertigo include cholesteatoma erosion (cyst in the inner ear) and otosclerosis (abnormal bone growth in the middle ear). Other than that feeling where the room is spinning, symptoms of peripheral vertigo include sweating, nausea, vomiting, pain or a feeling of fullness in your ear, hearing loss, and tinnitus (ringing of the ears). Your eyes may also move without your control. Central vertigo is caused by an injury to the brain or a disease, including an infection or illness, migraines, strokes, head injuries, multiple sclerosis, a tumor in the cerebellum, or transient ischemic attacks—also called mini strokes. In addition to the “spinning room” feeling, symptoms of central vertigo include headaches, trouble swallowing, and weakness. Episodes of central vertigo are generally much more intense and last for much longer periods than peripheral vertigo. People with central vertigo may not be able to walk or stand without assistance. Involuntary eye movements also last weeks to months with central vertigo. How Are Vertigo and Associated Diseases Diagnosed? A diagnosis of vertigo will depend on whether the cause is central or peripheral, and whether you have true vertigo. If you have true vertigo, the world will appear to be spinning. Lightheadedness is dizziness and not true vertigo. It also matters if you have life-threatening complications, such as sudden vertigo, vertigo linked with neurological signs like weakness or a severe lack of muscle coordination, and vertigo linked with deafness and no history of Meniere’s disease. The doctor will also retrieve the full medical history of the patient, which includes information about their recent illnesses and medications. A neurologic exam will then evaluate brain function to determine whether it is peripheral vertigo or central vertigo. The doctor will also rule out a stroke when there are new symptoms of vertigo. Signs of incoordination or abnormal eye movements will also pinpoint the underlying problem of vertigo. Romberg test: For this test, you will stand with your feet together and eyes open, close your eyes, and try to maintain your balance. It is used to investigate the cause of coordination loss. Head-thrust test: You will look at the examiner’s nose, and the examiner will make a quick head movement to the side. The examiner will look to see if your eye movement is correct. Dix-Hallpike test: In this test, you quickly lower from a seated position to a supine position with your head pointed either slightly left or right. Your eye movements help determine your vertigo diagnosis. This test will help recreate vertigo symptoms. Fukuda-Unterberger test: With this test, you will march in place with your eyes closed without leaning from side to side. This will help test your labyrinthine function through your vestibulospinal reflexes. Imaging tests: A MRI (magnetic resonance imaging) or CT (computerized tomography) scan of the inner ear or brain will help rule out a structural problem such as a stroke. How do you treat symptoms of vertigo? From a conventional medicine perspective, vestibular blocking agents (VBAs) are the most common type of treatment, and these include benzodiasepines, antihistamines, and antiemetics. The medications may provide some relief, but do not provide a cure from vertigo. Some of the most effective treatments for vertigo include particle-repositioning movements. One of these movements is the canalith repositioning procedure, and it’s designed to remove ear rocks or calcium deposits. Since inactivity has been associated with worsened vertigo, vestibular rehabilitation is a type of physical therapy that helps improve the vestibular organs. This rehabilitation will include improving balance, hand-eye coordination, endurance, and fitness. What are home remedies for vertigo? Since inflammation and stress increase the risk of vertigo, meditation, yoga, spending time in nature, and using essential oils like ylang ylang, lavender, and chamomile may help. Some homeopathic remedies that are also helpful for vertigo include nux vomica, cocculus, borax, tabacum, aconite, bryonia, and calcarea carbonica. Herbs and supplements that can further help reduce vertigo symptoms include turmeric, cayenne pepper, ginger root, ginkgo biloba, vinpocetine, and coenzyme Q10 (CoQ10). Acupuncture, chiropractic care, reflexology, and craniosacral therapy can also be effective for vertigo. Vertigo is a feeling of dizziness so severe that you are seemingly spinning. Other symptoms will include lightheadedness, headaches, fainting, tinnitus, or increased perspiration. Three of the main triggers of vertigo include labyrinthitis, Meniere’s disease, and benign paroxysmal positional vertigo (BPPV). The two key types of vertigo are peripheral vertigo and central vertigo. The condition will be diagnosed based on the type of vertigo you appear to have. Consult your doctor or natural health practitioner to determine the right treatment method for you. Some treatments include the canalith repositioning procedure, vestibular rehabilitation, homeopathic remedies, and stress reduction techniques like meditation or essential oils. Hershoff, A., N.D., Homeopathic Remedies: A Quick and Easy Guide to Common Disorders and Their Homeopathic Treatments (New York: Penguin Putnam Inc., 1999), 284-285. Balch, J., et al., Prescription for Natural Cures: A Self-Care Guide for Treating Health Problems with Natural Remedies Including Diet, Nutrition, Supplements, and Other Holistic Methods (Hoboken: John Wiley & Sons, Inc., 2004), 655-658. Lockie, A., Encyclopedia of Homeopathy: The Definitive Home Reference Guide to Homeopathic Remedies and Treatments for Common Ailments (New York: DK Publishing, Inc., 2000), 266-267. Schneider, B., et al., “Treatment of vertigo with a homeopathic complex remedy compared with usual treatments: a meta-analysis of clinical trials,” Arzneimittel-Forschung, 2005; 55(1): 23-29. https://www.ncbi.nlm.nih.gov/pubmed/15727161. Issing, W., et al., “The homeopathic preparation Vertigoheel versus Ginkgo biloba in the treatment of vertigo in an elderly population: a double-blinded, randomized, controlled clinical trial,” Journal of Alternative and Complementary Medicine, February 2005; 11(1): 155-160. https://www.ncbi.nlm.nih.gov/pubmed/15750375. “Vertigo? Why Homeopathy? It is safer and more effective,” Homeopathy Safe Medicine, March 3, 2014; http://safe-medicine.blogspot.ca/2014/03/vertigo-why-homeopathy-it-is-safer-and.html. “Types of Vertigo,” WebMD, last reviewed January 21, 2017; https://www.webmd.com/brain/types-of-vertigo#1, last accessed June 27, 2018. Taylor, D., “Vertigo (Symptoms, Causes, Treatments, and Home Remedies,” MedicineNet; https://www.medicinenet.com/vertigo_overview/article.htm#what_is_vertigo, last accessed June 27, 2018. Balch, J., et al., Prescription for Natural Cures: A Self-Care Guide for Treating Health Problems with Natural Remedies Including Diet, Nutrition, Supplements, and Other Holistic Methods (Hoboken: John Wiley & Sons, Inc., 2004), 655-657.